Range Rover Evoque with Victoria Beckham | What Car? The Range Rover Evoque Special Edition with Victoria Beckham which, as the name suggests, is designed in collaboration with Victoria Beckham has been revealed on the eve of the 2012 Beijing motor show. Central to the car's luxury and sporting theme is a hand-finished matt grey paint scheme, with gloss black finishes on the roof, side, bonnet vents, wheelarches and wheels. The look is embellished with rose gold accents on the 20-inch black alloys, badging and grille surrounds. The headlights and tail lamps have also been darkened. The stealth-like exterior design is complimented by a luxurious cabin with its four sports seats finished in Vintage Tan leather, with a prominent 'baseball' stitch detail chosen by Mrs Beckham as a tongue-in-cheek nod to her sportsman husband, David Beckham. The same leather also extends over the door inserts, arm rests and central storage area. Land Rover design boss Gerry McGovern spent 18 months with Mrs Beckham. She 'wanted to make a car that David would like,' he said. The rose gold accents from the exterior continue in the cabin, where they can be found on centre console rotary switches and the Drive Select Rotary shifter. There's soft-feel black paint for the switchgear, bezels, door handles and air vents, while the centre console is finished in piano black and dark textured aluminium. Luxurious trimmings continue with mohair mats and microsuede headlining, while the interior opulence is further enhanced by a four-piece luggage set lined in the same material as the rooflining. The sense of occasion is sealed with a hand-stitched leather wallet containing a Victoria Beckham-signed guide to the Special Edition's exclusive features. Powered by a 237bhp 2.0-litre turbocharged petrol engine, permanent four-wheel-drive is delivered to the wheels through a six-speed automatic gearbox. Average economy is 30.5mpg, while CO2 emissions are 199g/km. 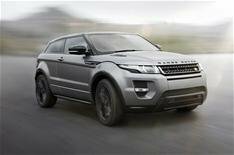 Equipment includes a Surround Camera System which offers a 360- degree view of the cars surroundings and Park Assist, which automatically steers the Evoque into a parking space while the driver operates the accelerator and brake. Entertainment is supplied by a 825W, 17-speaker audio system from Meridian. Victoria Beckham said: 'I was very excited to be working with Land Rover as I have an enormous amount of respect for the brand. Ive always driven a Range Rover, for me they are the epitome of quality and luxury. The Range Rover Evoque Special Edition with Victoria Beckham is limited to a maximum of 200 vehicles to be sold worldwide. It will go on sale first in China with deliveries from October 2012. 100 of the cars have been earmarked for the Chinese market. The special-edition model is expected to cost 79,995 in the UK. Land Rover has hinted there could be more Victoria Beckham special edition Range Rovers on the way. A Victoria Beckham Range Rover Evoque Cabrio and a special edition of the forthcoming new Range Rover would seem likely candidates.